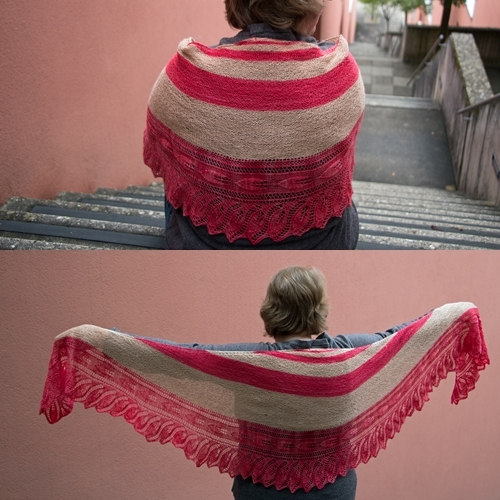 Can you believe this – I’ve self-published my 50th pattern today! Unbelievable! This definitely needs to be celebrated, so until the end of the year, buy my anniversary pattern Fibonacci’s Great Grandmother and get one of my other patterns for free with the coupon code Fibonacci! Fibonacci’s Great Grandmother is a crescent shaped shawl in two colors that are arranged in stripes following the Fibonacci sequence. The garter stitch body lets the beautiful border, Great Grandmother Edging from one of Barbara Walker’s treasuries, shine. It’s perfect for snuggling into and feeling hugged by your (great) grandmother whenever you need to feel their love. Congratulations on your 50th release!! !